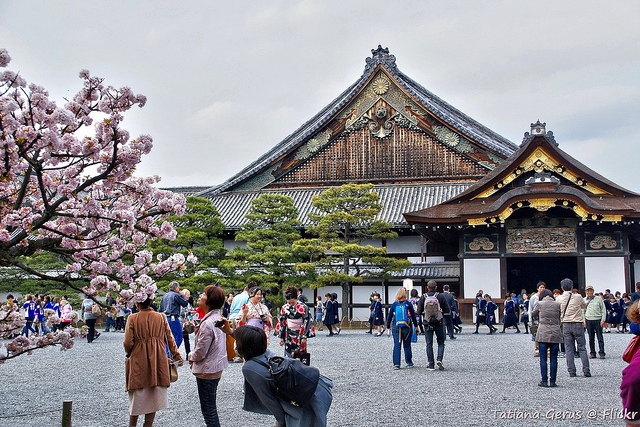 Nijo Castle was built in the Edo period, year 1603 for shogun Tokugawa Ieyasu as his Kyoto residence. It needed to be built on the plains in the central area of the political economy for not only defense facility, but feudal goverment. 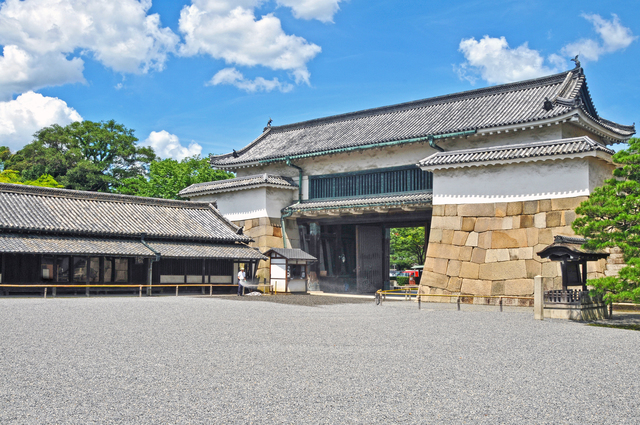 There are actually many castles named “Nijo” present in Japan’s history books, but nowadays when you think of Nijo castle, the one built by Tokugawa Ieyasu comes to mind. It was used for flashy celebrations until third generation shogun Tokugawa Iemitsu’s era, when it was abandoned for more than 200 years. During that period, the castle considerably aged and was partially destructed by fire, until 1860 when the reparations started. 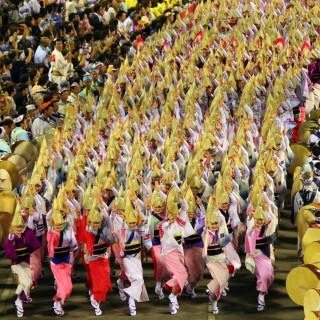 In 1867, it was the place where 15th generation shogun Tokugawa Yoshinobu returned the political power to the Emperor. 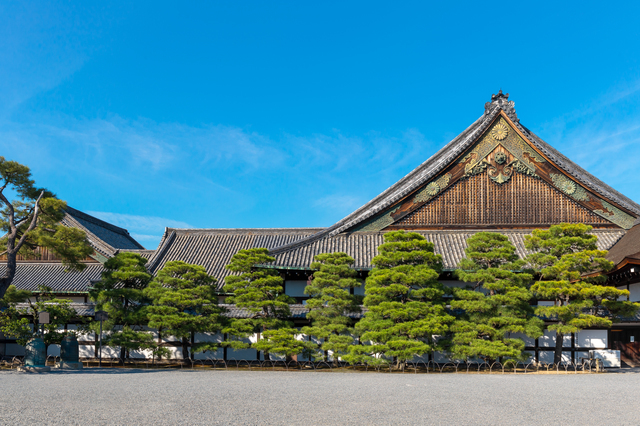 After this, Nijo castle started being used by the Emperor as his imperial villa. 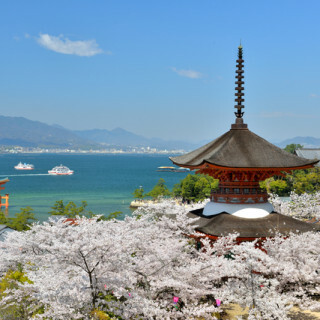 In 1939 the castle was donated to the prefecture of Kyoto, becoming a world heritage site in 1994. 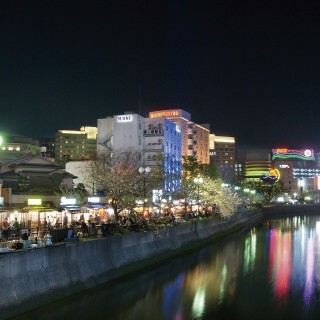 It is now visited by many people, having become the pride of Kyoto’s tourism. It is the building that represents Nijo castle. The guardrails are meticulously carved on both sides, an example of a very luxurious work. The entranceway was built large enough so that carts carrying nobles could go through. And if when you walk through the corridors, you will hear creaking noises. The floors were intentionally built this way using a Japanese technique called “Uguisubari” (a bush warbler), which makes the floors sound like a bush warbler is singing when someone steps on them, a good way to catch potential intruders. It’s not like there are actually a bush warbler on the ground and the corridor floor is not cracked, so rest assured! 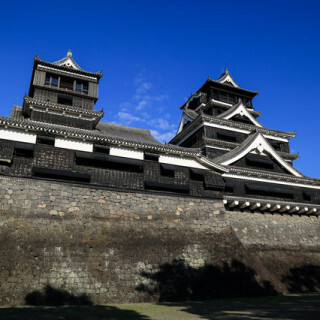 At the time of construction it had the same size as Ninomaru palace and was the representative building of the castle, but it was unfortunately lost to a fire. 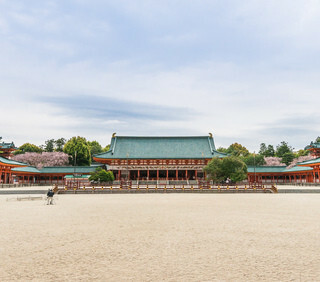 The current building is the former Katsura-no-miya Palace, which was moved from the northeastern area of Kyoto Imperial Palace. Unfortunately, it is not open to public. 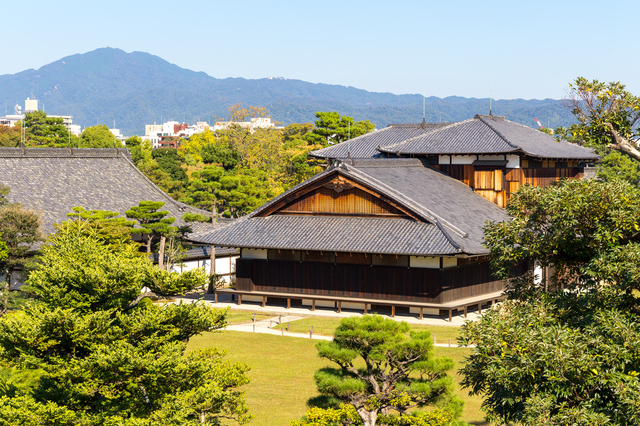 It is the most spacious part of Ninomaru Palace, divided into 5 sections. This was the place where the lords who came to the castle were welcomed. 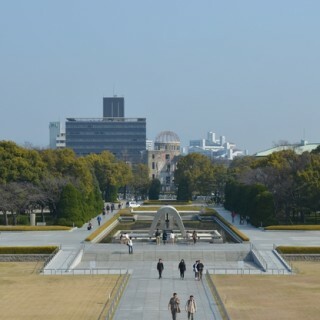 This was the place where the Shogun meet Imperial envoy. Imperial envoy sits on upper seat and the Shogun sit on lower seat. At that time, he was as Imperial represent to tell written Imperial order. Even if the one who welcome Imperial envoy is in a higher rank than him, the one has to pay respect to him as same as an emperor. 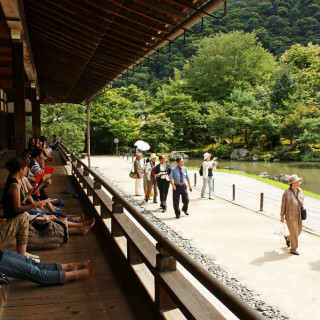 This was the place where lords meet the most important members of the Shogun’s council. It is said that the sliding doors in this room were painted by Edo period’s genius artist Kano Tanyu. 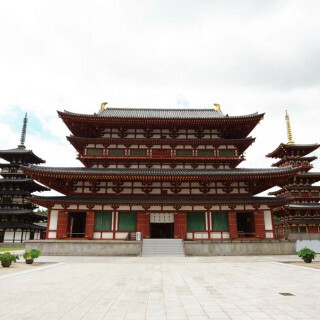 Being made out of four rooms, it is the most formal space inside Ninomaru Palace. The first room is the site where the 15th generation Shogun Tokugawa Yoshinobu returned the political power to the Emperor, the so called “Taisei Hokan”. 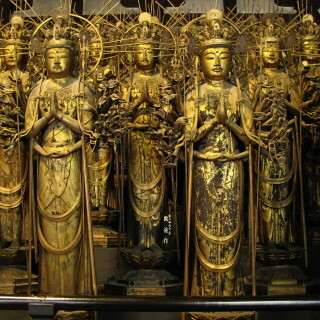 This room was a place where the Shogun met his successors and relatives of important lords. This room is smaller than Oohiroma, but room’s ornament is more brilliant. This was the Shogun’s living room and sleeping space. Being a private area, there are just a few painted sliding doors. Water and ink paintings are instead present. 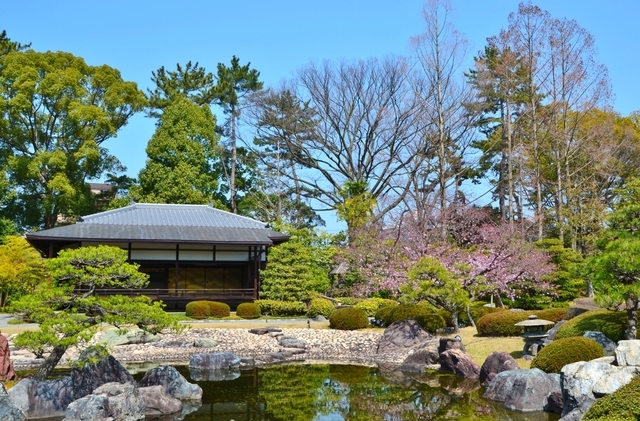 There are three gardens at Nijo Castle, Ninomaru Garden, Honmaru Garden and Seiryu Garden. The Ninomaru Garden dates from the Edo period and is based on “Shinsen Hourai Shishou”, the teachings of ancient China. Three stones looking like little islands exist in the garden, which symbolize the ideas of perpetual youth, longevity and prosperity. The Honmaru Garden unfortunately burned down together with Honmaru Palace and nowadays was turned into a karesansui garden (traditional dry landscape garden). 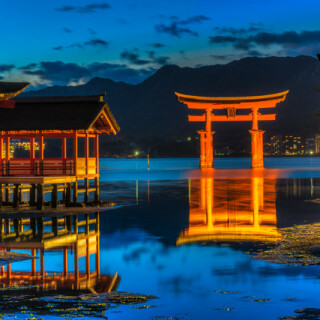 And finally, the Seiryu Garden was created during the Showa era. Even though after World War II it was made into a tennis court by the occupying forces, the garden was restored to its initial form in 1965. 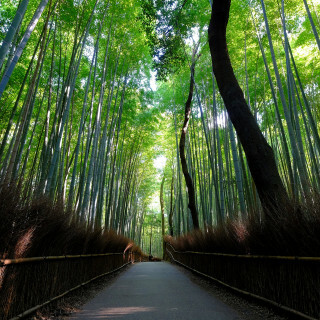 It is a garden that combines Japanese and western styles. It is an important property and was built in 1662. It is a big gate that visitors normally use to come in. An important property. 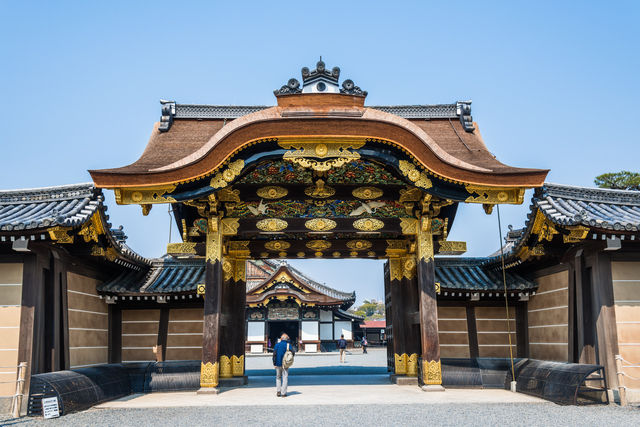 The main gate that leads to Ninomaru Palace. It is covered in gorgeous eye-catching carvings. 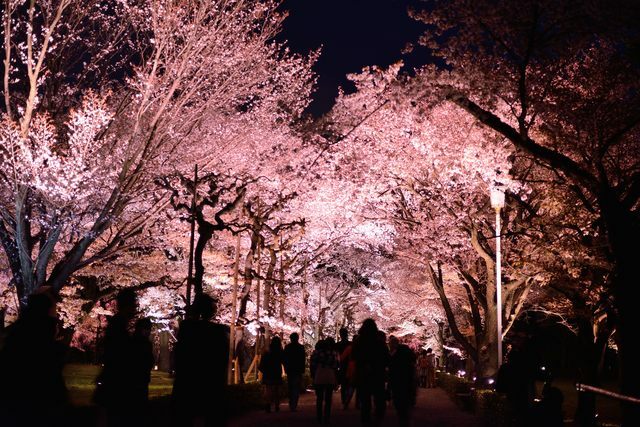 As soon as the cherry blossoms season comes, an illumination event is held every year. 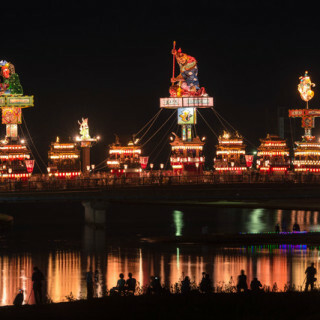 The event takes places between late March and mid April, from 6 PM to 9 PM. 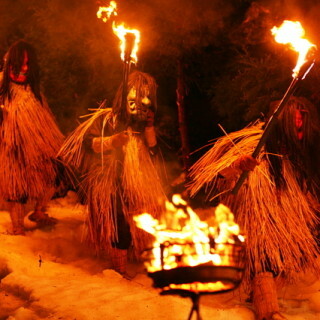 The entrance fee is JPY400 for adults and JPY200 for students. The visiting hours are opened when the daytime business hour gets closed. Entrace fee: JPY600 for adults, JPY350 for middle school students and JPY200 for elementary school students. Younger children can go in for free. Closed days: in the New Year’s holiday from December 26 to January 4 and every Tuesday in December, January, July and August. *You can rent an English audio guide! (also Chinese, Korean, French, Spanish). As soon as you go through the main castle gate, ask at the information kiosk. The fee is JPY500.